It was a night of tangible excitement in Cambridge on Wednesday, as Power2Peer hosted a panel discussion on the state of the energy blockchain. 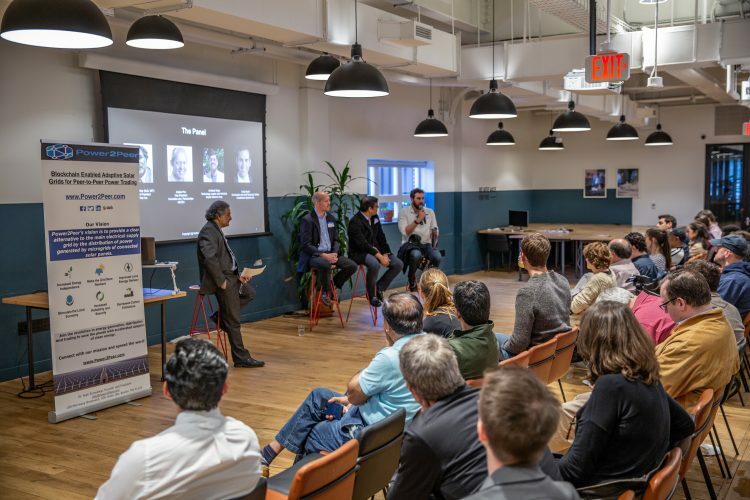 Over one hundred people of diverse backgrounds and interests filled a WeWork space on Mass Ave to learn and ask questions about the most recent developments in the game-changing technology that is striving to revolutionize the grid from top to bottom. Guests settled in with pizza and beer to discover the “new frontiers” of energy blockchain technology. Power2Peer president and CEO Dr. Nishikant Sonwalkar kicked off the night with a brief presentation on the potential impact in the green energy sector of the technology, which promises to maximize the efficiency of existing distribution channels. Also on the agenda were solar microgrids, smart controllers, and the application of blockchain to promote peer-to-peer transactions by helping connect solar panel owners with electricity consumers. Panelists Alistair Pim, Amitesh Singh, and Chris Taylor fielded questions from Dr. Sonwalkar on a range of issues pertaining to different applications of blockchain. Alistair Pim, VP of the NECEC, expressed optimism that although investment toward blockchain in the energy sector has shifted gradually, in time it will continue to grow organically in response to market forces. Part of this shift has been due to an increasing number of state governments investing in resilient power systems and related new technologies to safeguard against losses caused by outages. But Sonwalkar and Pim agreed that in addition to such government interest, the private sector stands perhaps to gain the most by improving upon what is now a largely inefficient system of transmitting grid energy from generation to consumption. Energy blockchains offer a solution that is efficient, resilient, and most importantly, secure. Amitesh Singh expanded on the centrality of security to the appeal of blockchain. With almost 20 years of experience in automation and control in the energy sector, he is well-versed in the challenges facing that industry with the boom of IoT smart devices. He referred to the risk associated with a “black hole” that has opened up in the space in terms of authentication mechanisms. With the number of smart devices used to operate a system (eight billion coming online each year), a bug introduced anywhere can threaten the whole. The panelists agreed that blockchain provides a key solution to security concerns by enabling immutable, transparent transactions, not only of power but data. Power2Peer’s focus is on using blockchain to provide benefits to consumers and communities, the grid and its operators, and ultimately to society itself through the reduction of carbon emissions. Power2Peer’s vision is to provide a clean alternative to the main electrical supply grid. By facilitating the distribution of locally generated power gathered by microgrids of connected solar panels, we can decrease dependence on centralized grids. By opting for Power2Peer’s adaptive solar microgrid system with blockchain-enabled peer-to-peer trading, people will be able to trade energy within local markets and get electricity through a decentralized power grid—a network of microgrids. This will allow them to access power that is there when they need it, even when the utility grid goes down during a storm. By increasing energy efficiency, people will pay less for electricity, earn revenue by selling surplus energy to their community, and contribute to a cleaner environment by lowering their carbon footprint. Power2Peer would like to thank our panelists, sponsors, organizers and attendees who made this event such a success. Special thanks to WeWork for hosting; we are all looking forward to continuing the fruitful discussions that were started on Wednesday. Be sure to check out our website and follow Power2Peer on Facebook, Twitter, and LinkedIn to stay up to date and be the first to know about our upcoming events. Power2Peer, Inc. is a Boston based energy blockchain startup aiming to change the economics of the energy industry through the introduction blockchain-enabled resilient and adaptive solar microgrids. The company is dedicated to decentralizing electric power across the globe, empowering local economies while significantly reducing carbon emissions and their impact on our environment.